No spills or leaks of any kind were detected after twelve empty freighter cars derailed early Saturday morning in the Truck Village Drive area near Mount Shasta said Union Pacific Railroad spokesperson Zoe Richmond. Because one of the cars was a tanker which had previously been carrying chlorine, all residents and businesses within a half-mile radius were notified of the incident, and a voluntary evacuation order was issued said Mount Shasta Fire Protection District Chief Chris Baker, who served as incident commander. "We took extra precautions," Richmond said. "Our focus was on ensuring that there were no spills or residue leakage from the empty tanker." Several agencies responded to the incident and were involved in investigation efforts — which took a full 24 hours to complete — including the Shasta Cascade Regional Hazardous Materials Team, the Federal Environmental Protection Agency, MSFPD, Mount Shasta City Fire Department, Weed City Fire, CalFire, California Highway Patrol, Mount Shasta Police Department, Siskiyou County Sheriff's Department, Siskiyou County Animal Control, Siskiyou County Public Health Department, Siskiyou Office of Emergency Services, Northtree International, Mount Shasta Ambulance, Department of Fish and Game, US Forest Service and Union Pacific. MSCFD Chief Matt Melo, who served as the evacuation coordinator and safety officer for the incident, explained that chlorine is a potentially toxic substance especially with prolonged exposure. "Mount Shasta High School was set up as the evacuation center," Melo said. "About 8 residents ended up there, although mostly just to check in and see what was going on." One business that was notified of potential danger was Furrpersons Pet Resort, which is located near the railroad on Truck Village Drive. Owners Stacey Chiment and Laurie King decided that the safety of their guests was of upmost importance, and made the decision to evacuate. With the assistance of US Forest Service officer Carmen Kinch, all 22 animals were loaded into vehicles and taken to a safe location in Mount Shasta. Meanwhile at the CFN gas station — which served as a command post — all officers involved were thoroughly briefed of the situation. Hazmat teams were then sent into the area of derailment in Level B suits to investigate the scene and to perform testing. After it was determined that there was no leakage, an "all clear" was given and the voluntary evacuation order was lifted around 6 p.m. Melo said. "Everything went very well. The situation was taken care of efficiently... Chris Baker did an excellent job as incident commander," said Melo. 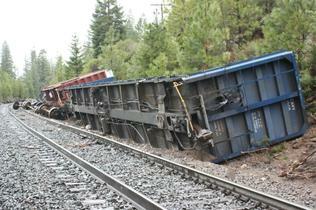 "The cause of the derailment will take a couple of weeks to determine," Richmond said. Before clean up began at the scene, photographs were taken and evidence was collected, including train wheels and pieces of the broken rail. These samples will be shipped to Union Pacific headquarters in Omaha, Neb., where a formal investigation will take place. No injuries were a result of the derailment, and damage to the track was relatively minor, Richmond said. The track was reopened early Sunday morning, when the first Amtrak went through at 6:20 a.m.